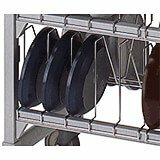 Keeps tray line and dishwashing areas organized and efficient. Securely holds 100 each 10" domes and/or pellet underliners. Cradles made of stainless steel. 17-3/4" x 10" x 16"
Easily and sanitarily dry your Cambro Shoreline insulated domes and / or pellet underliners with this Cambro CSDC dome drying cradle. 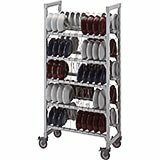 Each stainless steel cradle holds up to ten domes for secure storage. As an added benefit, this Cambro CSDC dome drying cradle fits into a Camrack base rack BR578 for quick, efficient dishwasher service. 36" x 18" x 75"